The Hop Review – Beer Interviews, Photography & Travel. – Brewer Chat: Curtis and Quintin of Vice District Brewing Co. Brewer Chat: Curtis and Quintin of Vice District Brewing Co. If you needed another reason to check out the South Loop, you're about to get one. One of Chicago's newest breweries, Vice District Brewing Co. will be opening up their taps and letting the beer flow. Housed in the historic Buick Building, at 1454 S. Michigan Avenue, Vice District aims to bring a neighborhood feel where patrons can kick back, grab a pint, and catch up with friends. We had the chance to sit down with co-owners, friends, and neighbors Quintin Cole and Curtis Tarver II to find out more about Chicago's newest brewery and taproom. Thanks for taking the time to sit down and grab a beer with us. Care to share a little bit about yourselves? Quintin Cole: Curtis and I met several years back. Not only are we great friends but we happen to be neighbors too. He was living on the street for a few months when I moved in and we started hanging out and we realized we both had a great fondness for craft beer. I travel quite a bit for work, so I'm able to bring back beer from different places. From there, we decided to delve into homebrewing. It started as a hobby, thinking we were going to save money. We spent more money just buying equipment, and it got to the point where our basements became consumed with brewing stuff. He's got a keezer that has four taps and I have a fridge with three, so between us we always have seven beers on tap. There are times I'll just walk over to his house when no one is home and pour myself a pint. We went to CHAOS for an open house and everyone there was great so we ended up joining. We just wanted to be around other people that brew, and there we met some really good people. Some really great guys and brewers have come through that club. So you started to brew more at CHAOS. Is that when you decided you wanted to open up your own place? QC: We always wanted to open up a neighborhood bar and once we started to play around with that and brewing we thought we should just open up a taproom and make beer. Curtis Tarver: Our passion wasn't about owning a bar, the passion has always been in the beer. I've never gone to a bar and ordered Jack Daniels and met a cool person. I have gone to a bar and ordered a beer, especially a craft beer, and had a conversation with someone I may not have had otherwise. That's the kind of environment we want to foster. Our build out is focusing on creating that environment. Tell us about the location that you guys finally decided on? CT: We looked at a few places over the past year. We decided we weren't going to pull the trigger until we found the right place. The building we have is great. There's some exposed brick and it even has landmark status. Things go a little slower this route since the city is passionate about it's buildings. QC: This location is really good for us. We are big sports fans. People come into town for Bears' games and this area takes off for game day events. It's great to be able to come to the tap room and be close to other things that are going on. That's a big plus for us. We really stuck to our guns when people were telling us to look at different locations. 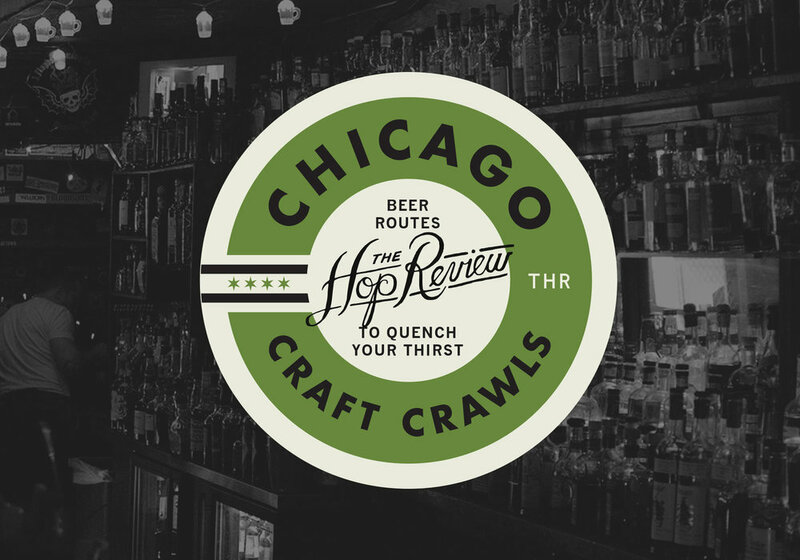 We thought the South Loop needed a place to drink beer. The closest place right now is Haymarket. Motor Row (formerly Broad Shoulders Brewing) has been building their place out so they'll be in the neighborhood too. The South Loop can sustain these kind of places and I think it's great for the community. Is your goal to bring more people to this neighborhood that may otherwise not come here? QC: We would love to do that and we hope that happens, but we also want to focus on the community around us and have this be a local place too. CT: Our long term goal is to get to a production facility further South. So the goal is to bring people to the South Side for sure. You're in the middle of building out your space, what can we expect when the doors open? QC: The space here is 2400 sq feet. We wanted all of this space devoted as a tap room. We'd rather have people go across the street for food, and drink at our place. We have a 7 bbl brew system with the capacity to pour up to 14 beers. We'd like to have some guest taps mixed in with our stuff. As for the environment, think Half Acre. It has a neighborhood feel, it’s intimate, a great place to enjoy a beer and conversation. With 14 taps you must have a lot of ideas as to what you want to be pouring out of your faucets. Whats the draft list going to look like? QC: We hope to have an ever changing lineup of beers. The Black IPA and the ESB will be staples, our flagship beers. We go back and forth on what’s going to make the final lineup though. We recently announced that we have found our brewmaster, Charlie Davis. We are really excited for Charlie to bring a few beers to the lineup as well. Your two flagship beers are a Black IPA and an ESB. What was the thought process when picking those as one and two? QC: If we are going to stand out, I want to stand out and introduce people to styles that may not be as big as IPA. Make these two good enough so that more people will go out and try a Black IPA or ESB. What was the process like finding your brewmaster Charlie Davis? CT: Fun! Every time you interview someone you get to drink beer. QC: We wanted to find someone who was as passionate about beer as we are. As well as someone who we got along with and liked to be around. This is a product we love to consume, but took on a whole new level when you learn how to make beer. We wanted to find someone who shared that view. Can you tell us more about Charlie's background? CT: Charlie started off at Finch’s and was a homebrewer as well. He spent some time in Ohio at a place called North High. That was probably the most impressive thing for us. They have a 2 bbl system and he was keeping like 15-20 beers on tap, so he was brewing non stop. And the beer itself was amazing. He’s got a great amount of creativity and he’s exceptionally diligent about the quality of his beer. When we were making our decision we wanted someone who would be around for phase two of Vice District. Someone who can help us grow. He has some aspirations to do things in this industry and I’m excited that we can give him a platform to do that. We want him to achieve all of the goals he has set for himself. QC: This was the red light district from Dearborn down to about 22nd. This was, at the turn of the century, the Vice District. Not Michigan Ave exactly, but this entire neighborhood. CT: When we were deciding on a name we wanted to do something that was true to the neighborhood. When you think of the Red Light District or Vice District, you think of a place where people can kick back and do some unscrupulous things. We want people to feel like they can head over, kick back and have a few beers. The name is a little unique because people wonder where it came from and why is there a badge in it. People were prospering at that time. Two of the most successful business women in Chicago were the Everleigh sisters and they ran a brothel. They charged $50 admission. That was big money just to get in. I think the name pays some tribute to that and you get to learn something about Chicago history. We love getting new breweries in Chicago, how has it been being a part of what seems a very tight knit brewing community? QC: While it took a while to get open, it has actually been great since we've made some great relationships along the way. Pete (Crowley) is like the Godfather of beer in Chicago. He looks out for everyone. If you are start-up, trying to do good things with beer, he’s going to help you out. Just being part of the whole Chicago beer scene has been amazing. It’s one of the few things that I am truly privileged to be a part of. Some of the most passionate people I have worked with and we are excited to be a part of it. Thanks to Curtis and Quintin for taking the time to sit down and chat with us. Check out the taproom located at 1454 S. Michigan Ave. Follow the progress at Vice on Facebook and Twitter and stop in for their grand opening in late August! Newer PostBeer & Branding: Hong Kong Beer Co.